Wales coach Warren Gatland has praised Mike Phillips following his retirement from the international game. The 33-year-old Racing 92 player is Wales' most-capped scrum-half having played 99 Tests - 94 for Wales and five for the British and Irish Lions. Phillips won 66 of his Wales caps during Gatland's reign, with the New Zealander praising his passion. 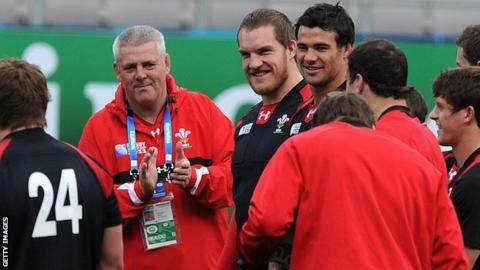 "Mike has been a huge part in Wales' success and an integral part of the squad since making his debut," he said. "His passion and dedication for Wales has always shone through and he ends his international career with Six Nations titles, Grand Slams and a Lions series win to his name and that is a great honour. "We would like to thank Mike for his service to Wales and to wish him well for the rest of his playing career." Phillips played in every game during Wales' Six Nations Grand Slam wins in 2008 and 2012, and when they won the title in 2013. Gatland also turned to Phillips when he was coach of the British and Irish Lions on their 2013 tour of Australia, picking Phillips in the first and third Tests as the Lions won the series 2-1. Phillips' last game for Wales was a World Cup warm-up game against Ireland in August 2015. Gatland left him out of the initial squad for the 2015 World Cup, but recalled the former Scarlets, Blues and Ospreys player following an injury to Rhys Webb. However, Phillips did not play during the tournament as Wales were knocked out in the quarter final by South Africa.